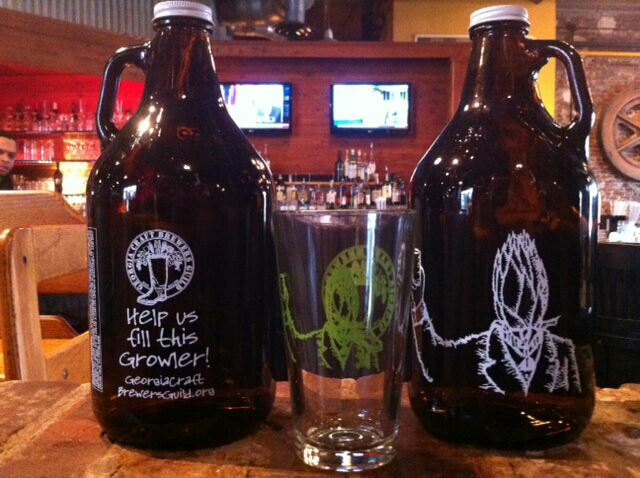 Wanna’ fill a growler at a brewery in GA? The Georgia Craft Brewer’s Guild just announced HB 314 has been introduced into the Georgia General Assembly. The intent of this bill is to allow an extremely limited exception to the three tier system by allowing Georgia craft breweries to sell no more than 288 ounces of beer per person per day for off-premise consumption. This is affectionately becoming known as the “fill the growler” bill. Before getting into why passage of this bill is important for all citizens of Georgia, one thing needs to be made perfectly clear. Terrapin, and the other breweries in GA, are all supporters of the current three-tier system of alcohol distribution. There is no doubt that without our distributors as our business partners, Terrapin would be nowhere as successful as we are today. We are in no way trying to change or disrupt the current three-tier system in Georgia. In fact, if this HB314 were to pass, 99% of all beer sold in GA would continue to go through the beer distribution network. However, the current restriction on brewery sales for off-premise consumption is putting Georgia at a huge disadvantage. To the best of my knowledge states that currently allow some form of off-premise sales at breweries include: Alaska, Arizona Arkansas, California, Colorado, Connecticut, Delaware, Florida, Idaho, Illinois, Indiana, Iowa, Kansas, Kentucky, Louisiana, Maine, Massachusetts, Michigan, Minnesota, Missouri, Montana, Nebraska, Nevada, New Hampshire, New Jersey, New Mexico, New York, North Carolina, Ohio, Oklahoma, Oregon, Pennsylvania, South Carolina, South Dakota, Tennessee, Utah, Vermont, Virginia, Washington, Wisconsin, Wyoming and Washington DC. Do these states know something that we do not? Apparently so. What they understand is this issue, first and foremost, is one of jobs and tax revenues. In the last two years it was announced that Sierra Nevada (CA), New Belgium (CO) and Oskar Blues (CO) are all building second breweries in or around Asheville, NC. These three breweries alone are estimated to spend almost $300 million on construction and add 269 jobs to the local economy. Just imagine the increased state income tax, sales and use tax, property tax, etc. that Asheville and North Carolina will be collecting from these operations. Millions and millions of dollars just up the road from Georgia. Could those hundreds of jobs and millions of dollars have been brought to Georgia instead? Two of these three companies at least looked at Georgia when deciding on a new location. If HB 314 had been passed at the time, would it have caused them to locate here? Maybe, maybe not. But there is no doubt that Georgia’s refusal to join the rest of the country in allowing off-premise retail sales at breweries was definitely part of their reasoning for locating elsewhere. Do you want to see Georgia breweries have events like Dark Lord Day at Three Floyds or Hunahpa Day at Cigar City, where special release beers are available at the brewery? If so, then please call and email your local GA State House Representative and tell them you are in favor of HB 314, the “fill this growler” bill. You can find info on who to contact here. This last step is vital. In fact, it is so important I am going to make sure no one missed this link. An anonynous member of the House Regulated Industries Committee (the group that must move HB314 from committee so it can be voted on) has stated that they have heard from several opponents to this bill but have yet to hear from a single supporter. The time is now to make your voice heard. This can only happen if you get involved. Sorry, I must be missing something here – I’ve read this through 3 times and don’t see how a brewery selling a couple of gallons more beer a day is going to add jobs and tax revenue? A typo? Is it supposed to say “288 ounces per person”? Or “288 gallons”? Or thing else altogether? It’s 288 ounces per person per day. My bad. I went back and fixed that. As to how it adds jobs and tax revenue, that is simple. It is almost impossible to open a brewery in GA and make it work with the current laws. This is supporting a rapidly growing industry and giving them a better chance of succeeding and becoming a large company employing many people. Terrapin currently has 42 full time people and 25+ part timers. Maybe there could be 20 more companies just like us in a few years if this bill becomes law. There is a reason there are over 170 breweries in Colorado and only 20 something in GA. Heck, Asheville, NC almost has more breweries than the entire state of GA. That is shameful. on February 22, 2013 at 4:16 pm | Reply Brent R.
Seriously, it is never a bad idea to stay in touch with your local Representative. I have had lots of opportunities to interact with politicians since starting a business and they are real people just like us trying to do the best they can for their constituents. They really do like to hear from us on all kinds of issues. I am totally for HB 314 for breweries to be able to sell their beer in growlers for off premise consumption. I think John from Terrapin hits the nail on the head when he says we “are all supporters of the current three-tier system” and that Terrapin and other breweries “would be nowhere as successful” without that, but the current restrictions put GA and their breweries at a huge disadvantage. John, I was planning on emailing you for your view on this. Thanks however for letting everyone know Terrapin’s view. I 100% agree on this bill adding more jobs. It will also add breweries. Last year I had the pleasure to visit 7venth Son Brewing in Dunedin, FL. Their place is smaller than any Barbaritos that we have here, brewing on a 1bbl system (currently expanding to the size of a small Zaxby’s). That night there was easy 30 people enjoying pints and filling growlers. If HB 314 passes many a homebrewer could fulfill their dream of going pro in Georgia. Will this bill allow customers to taste beer before purchasing growlers at retail stores not located at a brewery? This bill only applies to breweries in GA. The current laws for growler stores are county by county. I know some areas where sampling is permitted and some where it is not. …but the calendar only goes through Feb. 27th. If it does not pass this session when will it be up for legislation again? Hoping very much that it goes through but in case. Are you mainly interested in selling growlers, or do you want to sell cases too? We are asking for a chance for visitors to be able to take a special, hard to find beer back to friends and family. This beer could be available in growlers or it could be in bottles. In the past, we have packaged some of our very limited edition beers as draft only, and some as bottle only. Any additional news on this as of the week of March 4? It looks like the last legislative action was on 2/14. Did it die in committee? It’s being held over until next session. There will be hearings this summer. No info on those yet. Have yall heard anything else about this legislation? I think this is a great idea! It will allow use to purchase your special and “infused” beers for consumption at home, instead of being limited to what is currently only available in kegs and bottles. HB 314 is still alive. It is being held over until the next session in early 2014. Hearings are scheduled later this summer to try to find common ground between brewers, retailers and distributors. I have personally attended some of these meetings and I can honestly say everyone is listening to the other sides and we are brainstorming on ways to come up with something that will work for everyone. I’m cautious but hopeful.